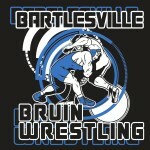 Bartlesville Wrestling Club is an independent 501c-3 dedicated to the success of children and families of children from Kindergarten to JV. We practice at BPS and attend tournaments throughout Oklahoma. We are thankful for Bartlesville Schools for the use of their facilities, logo and name. We encourage participation from anyone interested in wrestling. We encourage parent involvement and encouragement. We are proud to have wrestlers from Bartlesville Schools, Copan, Dewey, Caney Valley, and Classical Conversations homeschool group. We are blessed to have great Parents, Coaches and support from the community.